With mountains around North America preparing to open next month, it’s always a good idea to review the Skier Responsibility Code. This is especially true for kids. 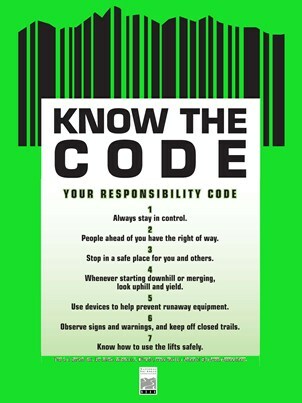 Knowing the code, and living by it on the mountain, will help keep you safe as well as other skiers around you. The Skier Responsibility Code is a set of rules of the road for skiers. In many states, including Washington, the code has been codified into law. Many of the ski injury cases I have worked are governed by the code and I use the code to establish liability. The code becomes the law of the case. (1) In addition to the specific requirements of this section, all skiers shall conduct themselves within the limits of their individual ability and shall not act in a manner that may contribute to the injury of themselves or any other person. (e) Cross the uphill track of a j-bar, t-bar, rope tow, wire rope tow, or other similar device except at designated locations. (3) Every person shall maintain control of his or her speed and course at all times, and shall stay clear of any snowgrooming equipment, any vehicle, any lift tower, and any other equipment on the mountain. (4) A person shall be the sole judge of his or her ability to negotiate any trail, run, or uphill track and no action shall be maintained against any operator by reason of the condition of the track, trail, or run unless the condition results from the negligence of the operator. (5) Any person who boards a rope tow, wire rope tow, j-bar, t-bar, ski lift, or other similar device shall be presumed to have sufficient abilities to use the device. No liability shall attach to any operator or attendant for failure to instruct the person on the use of the device, but a person shall follow any written or verbal instructions that are given regarding the use. (6) Because of the inherent risks in the sport of skiing all persons using the ski hill shall exercise reasonable care for their own safety. However, the primary duty shall be on the person skiing downhill to avoid any collision with any person or object below him or her. (7) Any person skiing outside the confines of trails open for skiing or runs open for skiing within the ski area boundary shall be responsible for any injuries or losses resulting from his or her action. (8) Any person on foot or on any type of sliding device shall be responsible for any collision whether the collision is with another person or with an object. (9) A person embarking on a lift or tow without authority shall be considered to be a trespasser. Here’s a great video produced by the Pacific Northwest Ski Area Association that makes the skier responsibility code a little more fun and accessible to kids.